Buying your first home can seem overwhelming. It can be hard to narrow down what you want, figure out what neighborhoods are the best and decide how much to spend – let alone do all of that with another person! My wife and I have had our fair share of disagreements while house hunting, so we’ve put together a few tips to help you find your dream home while putting your relationship first and not going crazy! 1. Figure out your priorities. Separately. One of the most helpful things my wife and I have done while house shopping was to each write out a list of what was most important to us in a new home. We then sat down together and talked over our individual priorities. It helped us understand what was most important to each other and why, and gave us room to discuss where we could compromise. As you make your list, use the questions below to guide you. Take time to ask yourself how important each item is: is it a deal-breaker, or just a nice-to-have? Think about where you’d be willing to compromise before you are asked to. What geographic area is ideal? Is commuting distance a factor? Staying close to family? What kind of community do you imagine living in? Walkable and urban? A gated community with a pool? Someplace out in the country? Do you want space and privacy or lots of neighbors? How big of a house do you want? Do you want to entertain or host overnight guests? What about kids? Is there anything specific you imagine having space for in the house, like an art studio or workout equipment or a grand piano? How much yard do you want? Do you imagine kids running around on an acre, kids and horses running around on ten acres, or a nice compact urban yard with minimal upkeep? How much renovation are you willing to undertake? Do you want a cool, old fixer-upper or new construction with brand new everything? What percentage of our combined take home pay am I comfortable spending on housing costs each month? Once you have had time to think through your own priorities and wants, sit down as a couple and share your lists. Talk about how your lists are similar and areas that might be different. This helped us immensely as we began the process of shopping for a home because it got us both on the same page early on, before either of us had a chance to fall in love with a house the other one hated. This is an important step that helps you determine how much house you can afford. Often confused with pre-qualification, which is an optional (and very preliminary) process to estimate the size of mortgage loan you could take out, pre-approval takes a more thorough look at your financial situation and is the first step in obtaining a mortgage. After verifying your income, assets and debt, and running a credit check, the lender will give you a pre-approval letter stating the exact amount their institution would be willing to lend you. This does not obligate you to ultimately use this lender, nor is the lender required to ultimately give you the mortgage. However, having a pre-approval letter in hand lets you move faster when you find the home of your dreams and is a smart first step to take before starting your house hunt in earnest. Once you have your pre-approval letter, revisit your conversation about finances. How much are you each comfortable with spending? 3. Find a great buyers agent. Some people save this step until the last minute, but finding an excellent realtor early in the home-buying process will save you time, energy and help make the entire experience much less stressful. A good buyers agent will take time to listen to what you are looking for in a home, will hand-pick houses you might be interested in, will work with your schedule to make sure you can see them as soon as possible and won’t try to rush you into a purchase. They will explain the whole home-buying process to you, answer your questions, and refer you to other professionals you will need (such as home inspectors and lenders). Having someone working for you early on can help you and your significant other focus on the difficult-enough process of deciding what home you want – your agent will take care of scheduling showings and walking you through next steps. Pull up Google and do two things. One, start researching neighborhoods and narrowing down where you want to live– remember, location is the one thing you can never change about the home you buy! Two, get on a good real estate listing site and see what’s out there. Your agent’s brokerage should have a website to search local listings, and local sites are usually more up-to-date and accurate than the big national websites. If you want a website with a mobile app, [Redfin] is usually more up-to-date and accurate than [Zillow] as it pulls directly from the MLS, although Zillow has some features that make certain things more user friendly. Share favorite homes with each other and talk about what you like and don’t like. Your realtor will be sending you listings as they come on the market, but it’s still helpful to get out there and look yourself. Plus, the better idea you each have of what kind of home will make the other person happy, the better the shopping experience will be for both of you. A little preparation, a lot of communication, and a good attitude can make shopping for your first house together an exciting adventure instead of a stressful experience. So enjoy it! Plan to go out for drinks after your first batch of showings. Walk around prospective neighborhoods together and check out the local parks and restaurants. If you are shopping from out-of-state and only have a short visit to see homes, think about staying at a local bed-and-breakfast instead of a generic hotel to make your trip a little more fun. 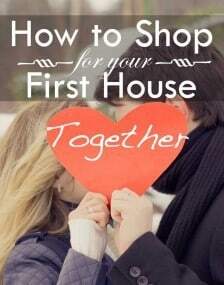 Buying your first home together is a big milestone! Have fun! And if you’re thinking about Durham, check out my personal blog at mattminordurham.com for great info and ideas for things to do!